"A form of half-sentient plant, often cultivated by apprentice wizards." Full disclosure, this is my third attempt at making something that looks like observers and sentries. 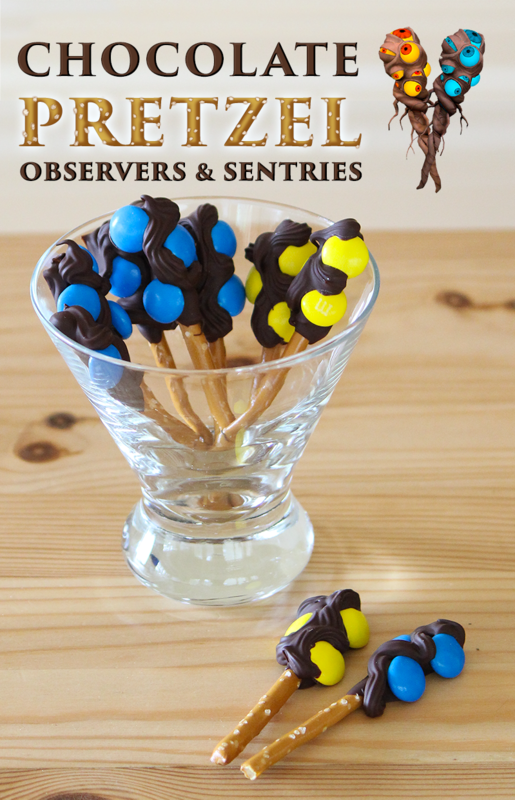 For the fifth Dota 2 The International (TI5) tournament, I made yellow and blue cake pops, with little eye balls. They were pretty cute, but - confession - I discovered I don't actually like cake pops. I found them a little too sweet, especially since my Dota 2 spread already included a bunch of sweets that I thought tasted better and more closely resembled the in-game item, like the lotus orb apple pastries and the aghanim's scepter madeleines. For the sixth The International (TI6) I tried to go healthier. I candy-coated apples in yellow and blue. Again, the aesthetic was sort of eyeball-on-a-stick, which isn't all that accurate for most ward cosmetics. The apples probably had better nutritional content, but I found it difficult to get a sufficiently bright candy coating, so I think they looked more like eyeballs-on-an-apple than proper wards. This year, I decided to throw out the USDA's nutrition guidelines. I wanted to mimic the default ward cosmetics with multiple little yellow or blue eyeballs on a single twisty sort of branch. I didn't want them to be too finicky since I had a few other time-consuming Dota 2 food projects to work on, so I came up with these chocolate and pretzel wards. M&Ms are about the right size and color, taking out a lot of the work from my previous attempts. Also, as far as I can tell from streaming Sumail and Arteezy, Eminems are very appropriate for Dota 2. I'm really pleased with how these turned out. They are super quick to put together and look quite recognizable! To really get the wizened wood effect, I probably should have used milk chocolate instead, but I think dark chocolate is so much tastier! Makes 20 observers and sentries. If you're up against a lot of invis heroes, you might need more sentries. Milk chocolate's color will blend better with the pretzels, but dark chocolate or whatever you have on hand works great! Lay out a sheet of parchment paper near the stove. 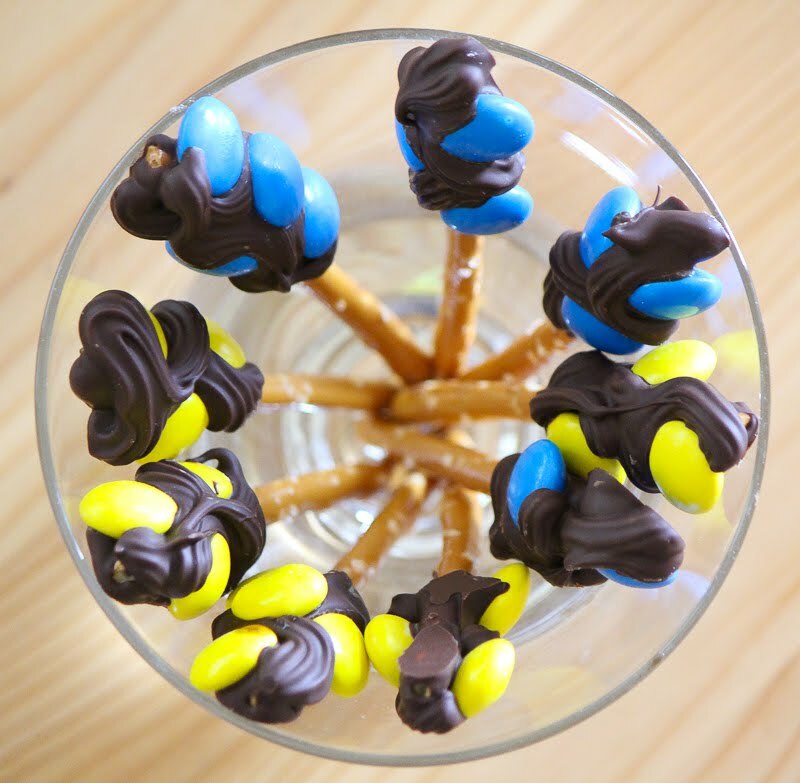 Have your M&Ms pre-sorted and your pretzels ready to go; once the chocolate is melted you'll want to work quickly. Prepare a chocolate piping bag. My normal approach for piping is to use a freezer bag, but freezer bags aren't quite sturdy enough for how thick melted chocolate is. Instead, I made a piping bag from parchment paper. It's surprisingly easy to make a parchment paper frosting bag, here's how: take a 12-inch length of parchment paper and roll it along the width into a tight cone. With scissors, snip off the tip to produce as large a hole as possible while still snugly containing the piping inserts. Fasten with a crinkly nozzle. Prop the piping bag upside-down in a pint glass to facilitate loading. Set up a double boiler of some sort. I fill a small saucepan with a couple inches of water, bring the water to a boil, and then put a pyrex measuring cup in the pot. Pour the chocolate pieces into the double boiler. Lower the heat to keep the water at a gentle simmer, and stir the chocolate continuously until melted through. Dip the end of a pretzel stick into the chocolate. Holding it horizontally above the melted chocolate, twist the pretzel to let excess chocolate drip off and evenly coat the pretzel tip. Lay the pretzel stick on the parchment paper. Press three candy chocolates logo-side down into the melted chocolate. Repeat to coat and decorate the other pretzel sticks. Now we're going to pipe the remaining chocolate in between the M&M crevices to fill it out a bit and add that twisted wood texture! Scrape the remaining melted chocolate into the piping bag. Twist the top of the bag closed. Wrap the piping bag in a tea towel to insulate your hands against the heat. Squeeze the bag over an empty spot of parchment paper to test it. Once you feel comfortable with the amount of flow, pipe chocolate around the M&Ms to fill into any empty spots and keep the M&Ms nicely secured. Wait twenty minutes or so for the chocolate to fully solidify, then lift from the parchment paper and arrange on a plate or in a cocktail glass to serve. I liked these a lot on their own, but I think they would be really cute as cupcake toppers. You could put them in green- and brown-frosted cupcakes (to represent radiant and dire) and call them cliff wards! They would also look adorable stuck in a ball of ice cream (Ancient Apparition's ice blast does give vision after all), or as a garnish for a nice cup of hot cocoa after a trying 2-hour match. Looking for more Dota 2 food ideas? Try these recipes!